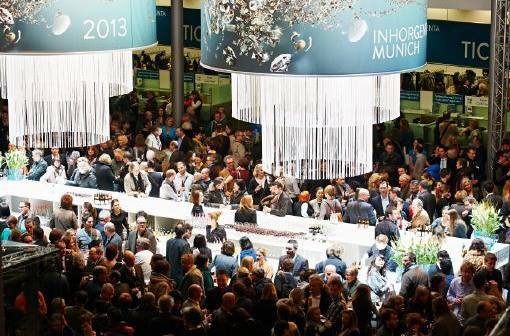 I was absolutely thrilled to be invited to visit Inhorgenta, in Munich, one of the largest Jewellery Trade Fairs in the world. I was made most welcome by the Inhorgenta social media team. Thanks to Katrin Budde and Mandy Sarnoch. The show itself is on once a year and took place from Friday 22nd – Sunday 25th February 2013. This year was Inhorgenta’s 40 Year Anniversary event, hosted in the fabulous Messe Munchen International conference centre. Even though the show has been around for years it doesn’t stand still. I visited Inhorgenta for the first time in 2011 and it had changed quite a bit since my last visit. Check out my previous post Inhorgenta 2011. But this time I was able to take photos as I was invited as a guest blogger. Now with 8 halls, the show truly is the “Crufts” of the Jewellery World and offers the latest news and trends in the world of watches, jewellery, gemstones and lifestyle. This included the New Trends and Vision jewellery hall which hosted some large jewellery companies exhibiting the latest trends and styles. This hall was very spacious and open and had a bar, chill out area, internet cube and gorgeous water fountain with stunning statues. When I visited Inhorgenta in 2011 I felt most of the halls were very warm due to the lighting of the stands and there wasn’t much space to sit down and chill. This year however, there were various areas where you could sit and relax, take time out and purchase refreshments from the small food stands and larger cafes located in various halls throughout the show. One reason I was eager to visit the fair was due to the variety of gemstones, beads and stones available to purchase. The stones are split up into 2 halls and could be found in the Bijoux and Carat halls. In my opinion, I feel that the stones should be merged into one hall, as I found it difficult to find some stalls I had bought from in 2011 and could have missed out some great stalls. Nonetheless, there is plenty to offer at the show whether you are interested in purchasing high end diamonds, sapphires, emeralds, pearls or semi-precious stones you will definitely find what you are looking for here. Inhorgenta really is the place to find unusual stones. Here is an image of a selection of the stones which I purchased at the show. As well as having the opportunity to purchase stones, you could also find out about the latest technology in the trade and purchase new tools and machinery, packaging and display. There was a whole hall dedicated to Timepieces, as well as one for Technology, and two others showing large jewellery brands. I was particularly interested in seeing the smaller jewellers located in the Contemporary Design hall. This hall included smaller collectives of jewellers and individual makers. The Brand New section was particularly inspiring and hosted young and new designers who produced a mixture of innovative, conceptual, product inspired jewellery and brand focused designs. I took the time to interview a few designers. The people I found most interesting in this section were Christian Wintersohl, Tom Stockl, Mirjam Dreher and Ania Kanicka. I will write a little about the designers in a separate post to come later. After such an inspiring Friday, what’s a better way to end the first day of Inhorgenta, than to attend a fabulous After Show Party with free drinks, food and entertainment and networking with people in the jewellery trade. If you are involved in the Jewellery industry, whether you are a jewellery buyer, designer or writer, I greatly suggest you visit the Inhorgenta Jewellery Trade Show next year.